You can use Filter in Price Monitor to adjust the number of rows in the table that you are working with, and only show rows with the specific information that you want to see. This first filter enables you to set your preferred number of items to show per page. Filtering it showing the status of your listings. Only Ended - Listings that already ended in eBay and were not yet deleted from DSM (appears with a green "relist" button next to it's eBay's stock status). Only Not Scanned Listings - Listings that you turn off the monitoring. Only with Notes - Listings that has notes added by you or by DSM. Only Out of Stock - Listings that are out of stock from the source website. Only Sold - Listings that have been sold. Only In Stock - Listings that are in stock from the source website. Price/Profit/Views/Sales/Qty: Exact number OR you can use < and > to set "lower than" or "greater than" for example <30 in views count means show all items with less than 30 views, >1 in sold will show items that were sold more than once. 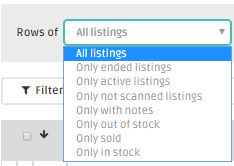 Note: When filtering quantity to zero ( 0 ), there's an option to show the listings that were in stock from the source website but were manually tagged out of stock on eBay. By default, it is sorted by days from newest to oldest. you can click on the field names to sort it from lowest to highest or vise versa. This filter allows you to set your preferred MIN and MAX value for the item information such as Profit, Quantity, Source & Target Price, Views & Watchers and Number of Sales.